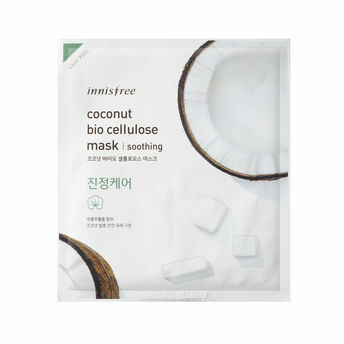 This bio-cellulose mask is formulated with Centella asiatica extract to soothe dry and rough skin. Coconut bio-cellulose made from fermented coconut water is a naturally-derived sheet that comfortably adheres to facial skin as if wrapping it in a second skin, and keeps it moisturized all day with the capacity to maintain abundant moisture. Combination of coconut water and coconut oil provides dry skin with moisture, and forms a moisture film to soften skin.